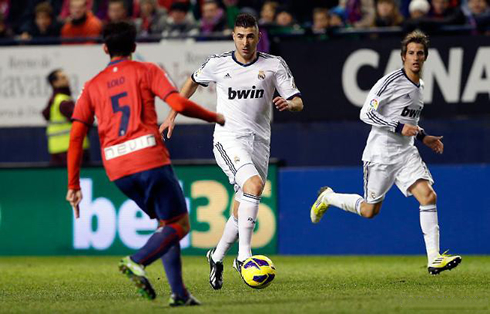 ﻿ Osasuna 0-0 Real Madrid. No Ronaldo, no attitude, no ambition! 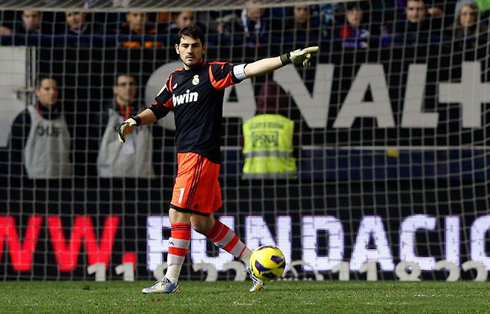 12.01.2013 » Osasuna 0-0 Real Madrid. No Ronaldo, no attitude, no ambition! Real Madrid visited Osasuna in La Liga's gameday 19, but got held to a 0-0 draw and now risk seeing Barcelona extending the gap into 18 points. With the Spanish League virtually over for the Merengues, José Mourinho has now clearly set his sight at the Copa del Rey and the UEFA Champions League, even though we've just reached halfway in La Liga after this weekend's games are completed. Cristiano Ronaldo was forced to miss last night's match after accumulating 5 yellow cards in the league, but the Portuguese player absence can't be enough to explain such a lack of attitude and ambition from the remaining squad players. A club with Real Madrid's dimension simply can't afford to be that depending on a single player, as well as giving up on fighting for the league title so early in the season. With Pepe and Marcelo still recovering from injuries and Sergio Ramos unavailable to give his contribute after picking a 5-game suspension, Real Madrid's defence continues being improvised on a game after game basis. Suprisingly, the Merengues kept a clean sheet for the second straight game, but faced a bigger problem when it came to create danger in the attacking areas. Without Cristiano Ronaldo's presence on the pitch, there was no one in the team proving to be capable to step up to the occasion. This apathy can be interpreted as an alarming signal for the club's future, especially if Ronaldo ends up picking an injury or even if he decides to switch from the Spanish champions side for Manchester United, at the end of the season. 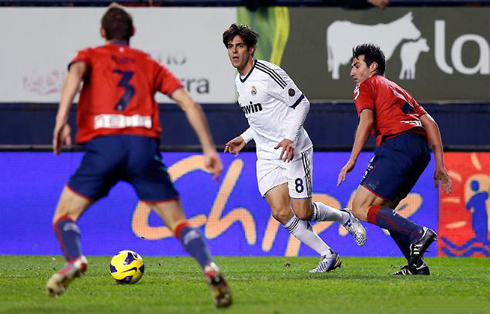 Osasuna came into this game ranked last in the league, with only 3 wins out of their 18 games played so far. Regardless of how far Real Madrid actually is from the league leaders, the Spanish champions can't afford to put on such a poor display on the pitch. However, it's true that apart from the setbacks concerning Real Madrid's defence, as well as not being able to count with Ronaldo, having players such as Benzema or Mesut Ozil starting on the bench probably didn't help much the team into finding a good pace and rhythm in the game. 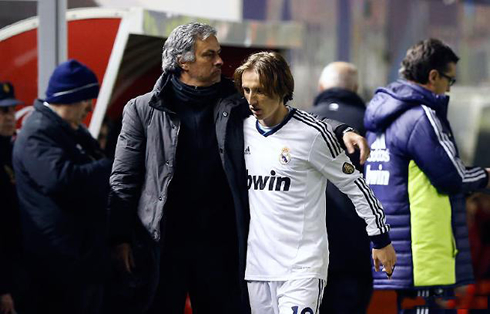 Unlike in recent games, Luka Modric didn't manage to organize the team's midfield and there were very few moments where the team actually looked to know what they were doing. Callejón and Angel di María had the particular mission of stretching the Merengues' game as most as they could, but they have also failed to create many goalscoring chances, since Osasuna never granted them with enough space to explore on the wings. José Mourinho realized his team wasn't responding as it should on the pitch, but none of the changes he made during the course of the 2nd half ended up having any positive impact in the game. Quite the contrary actually, since one of the substitutions led to Kaká replacing Gonzalo Higuaín in the 57th minute of the game, and the Brazilian didn't last more than 19 minutes on the pitch, as he got sent off in the 76th minute. It's the third game on a row where Real Madrid gets to end it playing down to 10 men, and this has also been the third match this season where the Merengues failed to score a single goal during the full course of a game. With Barcelona taking on Malaga this Sunday night, the Merengues can find themselves 18 points behind their rivals, and also 7 points below Atletico Madrid, if the Colchoneros manage to beat Zaragoza at home. At this stage, no one certainly doubts that José Mourinho has set his targets into the Spanish Copa del Rey and the UEFA Champions League, which necessarily adds more pressures into this Tuesday's game against Valencia, for the first leg of the Copa del Rey quarter-finals. Fortunately, Cristiano Ronaldo should return to the line-up for that game and Real Madrid will attempt to get back to the winning track. Cristiano Ronaldo next game for Real Madrid will be against Valencia, for the Spanish Copa del Rey, on January 15, 2013. You can watch Juventus live stream, Real Madrid vs Valencia, Barcelona vs Malaga, Manchester United vs West Ham and Arsenal vs Swansea, all matches provided from our soccer live section.